What size is your winery? Fratelli Perata Winery produces approximately 100 barrels of wine every year (there are 24 cases of wine per barrel), depending on the size of our crop. Since our vines are dry-farmed, the tonnage varies from year to year. What does dry-farmed mean and how does that relate to the amount and quality of wine you produce? The water the vines receive is from the yearly rainfall, not from irrigation with well water. That's enough as usually we receive ample rainfall, about 17 to 20 inches a year, during the winter, or early spring, enough to keep the vines producing up to 2 tons/acre of grapes. We don't want any more! If we were after a big crop of 5 tons/acre and up, we would water and fertilize to make more clusters with bigger berry size but we are after small berry size and low tonnage because the flavor and color are in the skin of the grape, not the pulp. A vine with a few clusters will produce smaller berries with the most flavor and color; exactly what we are looking for the "Fratelli Perata" style. We planted most of the vineyard in 1980. We?ve planted a small amount just lately for an unfortunate but very good reason: In 1980, we were pretty isolated from other vineyards. The vines were planted on their own roots. now we are almost surrounded by new vineyards. Any time there is a concentration of a crop, disease is more likely, so we planted the new vines on disease resistant rootstock. These new vines are our insurance policy against disease. If we feel the presssure, we can interplant vines on grafted rootstock in between the old vines we planted in 1980, then pull out the original vines when the new ones reach production. We are on 40 acres, with 25 planted in 1980, and just about 6 new acres. Why did you choose Paso Robles for a vineyard site? Perfect microclimate and soils. We are on hills, so cold air flows down. We like red wines, and it gets warm enough during the day, with the nighttime temperature about 40 degrees cooler. Temperature is important because warmth during the day produces ripe, flavorful fruit and cool nights maintains acid. Our property and nature produces wines with good balance! Who is your winemaker and what is his training and style? 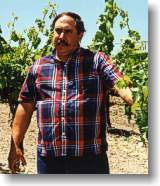 Gino Perata, one of the "Fratelli" (brothers), is the winemaker. Gino's father came from Italy, where he learned winemaking from his father. He grew up helping to make wine for the family every year. After getting a Bachelor?s Degree at Cal State, Northridge, and a Master?s Degree at Washington State University, Gino took classes at the University of California at Davis (world reknowned for its oenological programs) to supplement what his father taught him. Gino loves to make big red wines with concentrated flavor and color, unfined and unfiltered. Great fruit. They age well, most to 7-10 years. Everyone has their favorite: the Cabernets are rich and big; Merlots have great depth and flavor; Sangiovese is classically Italian style; Zinfandel is big, ripe, and spicy. And then there are the special family named blends. If you have any questions you would like answered, PLEASE let us know! We'd love to hear from you. Write Carol Perata and ask!